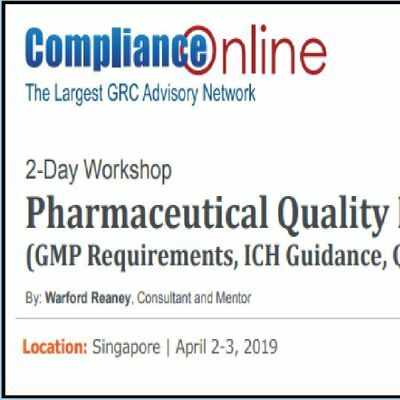 Pharmaceutical Quality Management System (GMP Requirements, ICH Guidance, QbD, and USFDA/EMA Regulations): 2-Day Workshop, taking place on April 2-3, 2019 in Singapore. One of the fundamental concepts of “current Good Manufacturing Practices” (cGMP) is that companies that manufacture and/or test medicines should be in a constant “State of Control”; in other words the medicines produced should have pure raw materials, appropriate equipment, cleanliness, trained personnel, accurate testing and everything documented from first to last. 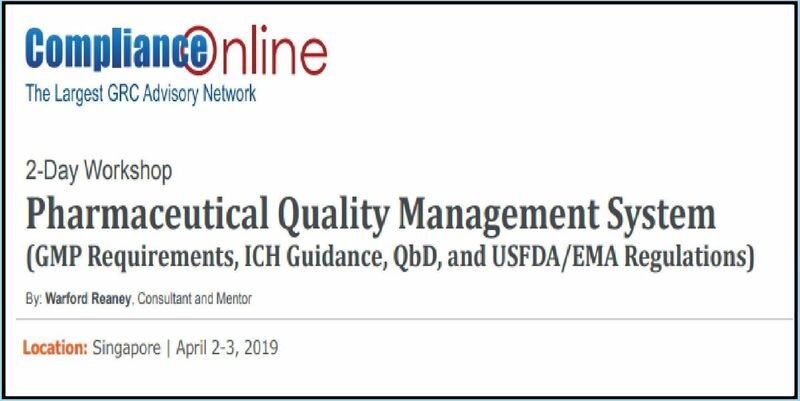 ICH-Q9: Risk Assessment and the role of assessing Risk in the development, manufacturing, testing and supply chain of drugs. Wednesday, March 6 is the last chance to register & save 15% on TOP of Early Bird pricing. Be sure to mention Coupon Code “324770” when checking out to avail flat 15% off..
Register Now => or follow the below link. This course is designed for people throughout the GMP Operations with a focused emphasis on the Plant & Global Quality Units; Departmental Heads, Managers & Supervisors; and Plant Management. In addition, all GMP operations personnel could benefit, especially those selected SMEs within the organization who will face the inspectors. To view the complete agenda, download the brochure. Register Now => Register Now Pay Later: to reserve your seat on 15% discount on TOP of early bird price; valid till March 6, 2019. Just Fill this Pre-Registration Form (pdf) and email it to us. We will get back to you with your registration confirmation. In case of any change in your schedule, you can cancel or substitute your registration 30 days before the event date.